Hoop house sounds like a nickname for a basketball arena. In the field of agriculture, however, it’s a term for a kind of light yet sturdy, metal-framed greenhouse with a clear polyvinyl cover that can be erected anywhere it’s needed. A hoop house provides a year-round environment for growing vegetables, flowers and other cold-sensitive plants. 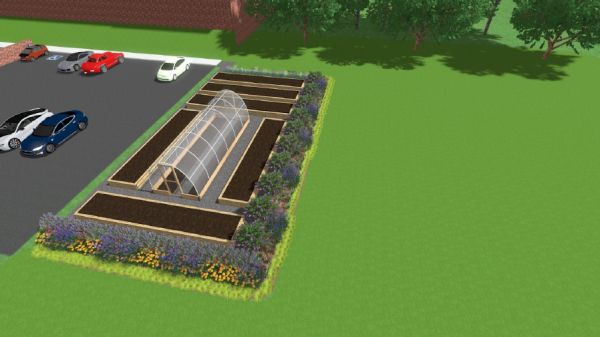 Kalamazoo College’s Just Food Collective collaborated on a proposal for a “hoop house” greenhouse that, with contributions from alumni and friends of the College, will greatly expand the year-round gardening space at the College. 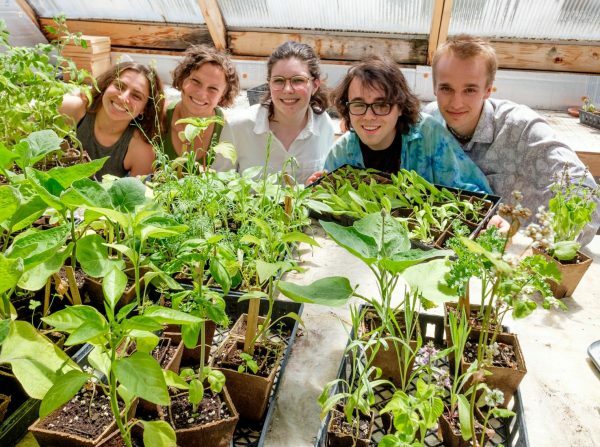 Gathering in the College greenhouse the group currently uses are some of the Just Food Collective members involved in the proposal (from left): Maya Gurfinkel ’20, Aiden Voss ’20, Natalie Thompson ’19, Elliott Boinais ’21 and Lee Carter ’18. This fall, thanks to a well-crafted proposal by the student members of Kalamazoo College’s Just Food Collective, a program of the Mary Jane Underwood Stryker Center for Civic Engagement (CCE), and the generosity of donors, an 1,800-square-foot hoop house will rise in a corner of the intramural field north of the Fitness and Wellness Center parking lot. It will be several times the size of the College’s existing greenhouse behind Hoben Hall. And unlike that structure, where potted plants are grown on tables, the crops in the hoop house will be planted in ground-level boxes, making them easier to tend, sustain and harvest. Ultimately, say student organizers such as Lee Carter ’18, a CCE Civic Engagement Scholar, the food produced in the hoop house could become part of the supply chain for the College’s Dining Services and perhaps for other food programs in the Kalamazoo community. It’s part of a wider goal of the Just Food Collective to increase the use of locally sourced food, easing nutritional inequities, bringing more transparency to the food supply system and reducing the College’s carbon footprint. The idea has been around for over a decade. CCE Director Alison Geist says it got its start with a group called Farms to K, a program that grew from the service-learning first-year seminars Cultivating Community, first taught in 2008 by English professor Amelia Katanski ’92, and Roots in the Earth, led by College Writing Center Director Amy Newday, that focus on food justice and sustainable agriculture. Katanski and Newday serve as advisors to the group and Larry Bell ’80, founder of Bell’s Brewery, has provided support. An artist’s depiction of the College’s new 1,800-square-foot hoop house, which will be erected in a corner of the intramurals field north of the Fitness and Wellness Center. 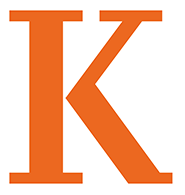 The CCE, students and faculty revived and expanded the mission of Farms to K in spring 2016 as the Just Food Collective, whose mission includes policy work on food insecurity. The students involved included Carter, who says he grew up in a “back to the land, homesteader” household in rural New Hampshire that always had a vegetable garden. With Newday, an owner of Shelbyville, Michigan’s, Harvest of Joy Farm, as mentor, they drew up a simple proposal for a hoop house, and Anika Sproull ’17, wrote a senior individualized project (SIP) advocating that K invest in sustainable agriculture. Over the next two years, more than a dozen students devised a detailed, illustrated proposal and prepared a presentation that, Geist says, “just bowled over” President’s Staff. The proposal lays out the plan and explains how it would provide learning opportunities for existing classes and connect to campus programs such as a composting initiative. It also details the involvement of paid and volunteer student workers, tells how it would fulfill existing College policies concerning environmental justice and sustainability, looks at what other colleges and universities are doing and even includes the results of an informal survey demonstrating K student support for the idea. Alumni and other supporters of the College, impressed by the plan, contributed the $26,200 needed to fund it. “I was personally blown away by how quickly [the College] raised the money,” says Just Food Collective Civic Engagement Scholar Natalie Thompson ’19, who participated in the presentation. As a 2018-19 Civic Engagement Scholar, Just Food Collective member Elliott Boinais ’21 will be in charge of the project, advised by Newday. Geist cites it as a “fellowship in learning” — a principle that has illuminated the College’s approach to education for almost a century and which defines the CCE’s mission. “It provides a prototype for what this kind of collaborative learning community can look like and achieve in the future,” she says. “I hope it’s going to outlast our time here,” says Just Food Civic Engagement Scholar Aiden Voss ’20. The graduating Carter regrets he won’t be around for the completion of the hoop house, which the philosophy major says he has dreamed about since he was a sophomore in a nearby Living-Learning Housing Unit, gazing at the intramural field as he drank his morning coffee while sitting on a sofa he dragged onto the porch. Still, his K-Plan has revolved around food, with a SIP on food and philosophy and his experience helping lead a sustainable agriculture initiative. And his next step demonstrates the value of the education he received when, he says, he chose K over culinary school: This fall, he will begin work as a line chef at Canlis, the James Beard Award-winning restaurant widely acclaimed as Seattle’s finest. “It’s really worked out,” he says. This entry was posted in News Stories and tagged civic engagement, giving, philosophy, SIP, student organizations, students, . Bookmark the permalink.